Pefkos is well known for its leisurely pace and tranquillity. Relaxing holiday and a traditional taste of Greece. The Residences have their own dedicated private entrance. 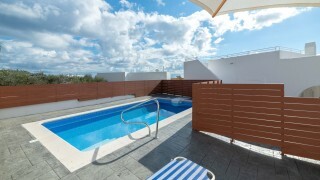 The Milos complex comprises four self-contained villas and is situated in the quiet northern part of Pefkos village. The Milos villa complex is situated in the quiet northern part of Pefkos village, 300 m from the main beach of Pefkos, only 4 km away from the famous village of Lindos and 45 km from Rhodes Airport. Against the backdrop of rugged mountains, the balcony and terrace views from the villas look over the rugged and unspoilt landscape of Pefkos towards the sparkling Aegean Sea. This is an ideal place for both families and couples who are looking for a relaxing holiday and a traditional taste of Greece. 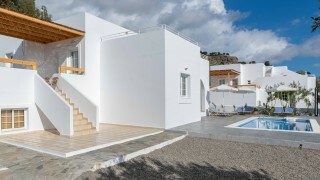 The Milos complex comprises four self-contained villas. Each villa has a private entrance, a parking area for two cars and a private swimming pool complete with sun loungers and umbrellas. All the villas have a fully equipped kitchen, washing machine, satellite TV, air-conditioning in the bedrooms, a safe box and Wi-Fi internet, and have all been decorated in a simple, clean and modern style. The gardens are well-tended, with flowering plants and trees providing some extra privacy. Villas Liana, Anastasia and Arete can accommodate up to six people and Villa Gema up to four. Sheets and towels are changed twice a week or three times if required. All villas have a daily cleaning service and the sheets and towels are changed twice a week, or three times if required. The semi-detached Arete and Anastasia villas are almost mirror images of each other. Each villa has a private entrance, parking for two cars, a large garden stocked with plants and trees and a private swimming pool. The double and twin bedrooms in each villa have air-conditioning and spacious wardrobes and each bedroom has a bathroom with a shower/bath and wc. The villas also offer Wi-Fi internet and a safe box for your belongings. The sun terraces and roof-top balconies have a table and chairs so that you can enjoy your meals while taking in the sun and the sea view. The ground-floor entrance leads into a seating area with two chairs, a twin sofa bed and a small table, then a short flight of steps takes you up to the twin bedroom with its adjoining bathroom. At Villa Anastasia, there is a small table and a sofa bed outside the bedroom. Another short staircase leads you down to a light and airy fully fitted kitchen and dining area with plenty of seating and satellite TV. The fully equipped kitchen has a fridge-freezer, full cooker, toaster, kettle and washing machine. Also on this lower level is a double bedroom with adjoining bathroom. This is the first of the larger villas. From the private driveway, you enter the ground-floor sitting room, with its table, two chairs and a twin sofa bed. Eight steps then lead down to the kitchen and dining area, which has satellite TV. The fully equipped kitchen has a fridge-freezer, full cooker, toaster, kettle and washing machine. From the ground floor, seven steps take you up to a small sitting area with a table and a pull-out twin sofa bed offering extra sleeping space. The double and twin bedrooms leading off this room are both air-conditioned, have spacious wardrobes and adjoining bathrooms, each with a bath/shower and wc. The villa also has Wi-Fi internet and a safe box for your belongings. The villa has a furnished patio and a roof-top sun terrace and balcony with table and chairs, where you can enjoy your meals while taking in the sun and the sea view. There is a private entrance with parking for up to two cars, a large garden stocked with plants and trees and a private swimming pool. This villa has a garden, a private entrance with parking for two cars and a private swimming pool. The villa Gema is open plan on two levels to maximise the space and light, each element flowing into the other. Rest assured that the bathroom, equipped with a bath/shower and wc, does have a door for privacy, so the villa is ideal for a family or close friends. As you enter the villa, you will see to your left a sitting and dining area with a sofa, chairs and satellite TV. To the right of the entrance is a raised Lindian-style double bed in an air-conditioned area with wardrobe space. Further inside on the same level are a separate bathroom and a separate, fully equipped kitchen with a fridge-freezer, full cooker, toaster, kettle and washing machine. A seven-step wooden staircase leads down to the sitting area with two sofa beds and a table. The villa also has Wi-Fi internet and a safe box for your belongings.